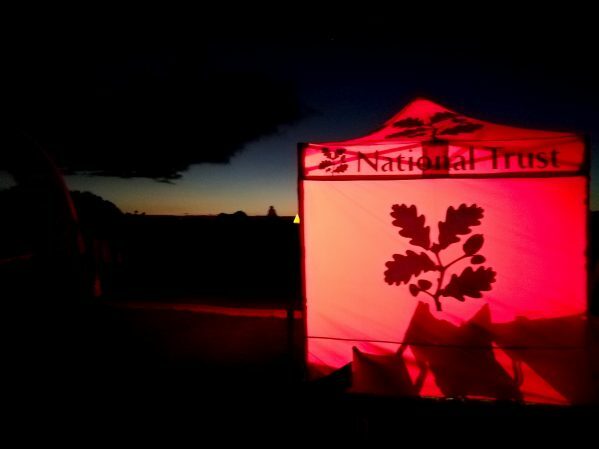 Believe it or not the National Trust’s South West Outdoor Festival was my first visit to a festival of any kind and I am pleased to say that I really enjoyed it. We Blondes weren’t just there for fun though as we were representing Ordnance Survey in our role as Get Outside Champions. 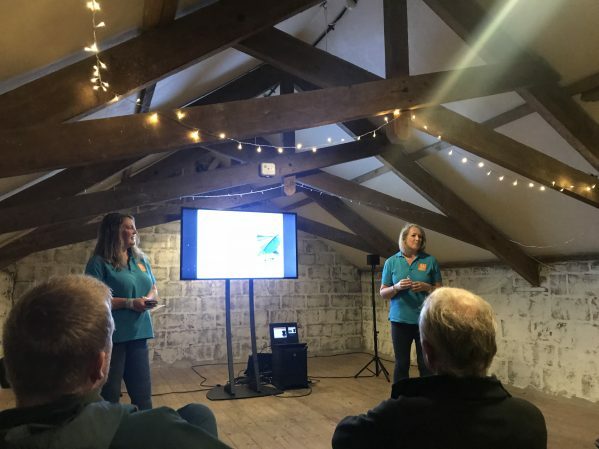 we did a talk (many thanks to our appreciative audience) about Dartmoor on the Friday night and ran two navigation workshops on the Saturday. In the end and despite nerves, we enjoyed all three of our events and still had plenty of time to listen to a couple of other talks, chat to fans (apparently we have some) and sample some fine local ale. Here are my top tips for surviving an outdoor festival. This is easier than I had previously though because, although there can be a tendency for outdoor events to have an Up North bias, there’s the Kendal Mountain Festival (coming up soon) for example. Outdoor festivals and particularly walking festivals are popping up all over the country. By choosing local (and maybe smaller) you will be supporting your local area and will cut down on travel times and related environmental impact. Although I have had many nights in the campervan with Mr B2, this was its first adventure into the world of Blonde. This is partly because I dislike driving so much but… my driving was gaining confidence after we had circumnavigated South Devon a couple of times (including a ferry) because I had left the memory stick for our talk in the back of the computer at home. Having a non-canvas home in which we could sit, sleep (rather too long one morning) and cook, made all the difference. The ‘Fun Bus’ will be Blonding again! Another advantage we Blondes discovered about attending a local outdoor festival was that lots of our outdoorsy friends attended too. Quite by accident, a group of five outdoor women who have been trying since February to do some outdoor getting together (although February did end up being snowed in) found themselves in one (rather small) camper van enjoying chatter, hats and giggles. If the South West Outdoor Festival had been this weekend it would have, quite simply, have blown away. As it was we had wind and rain on the Saturday followed by sunshine on the Sunday. It is worth remembering that tents, camper vans and even barns all have a tendency to be chilly in October although the most excellent National Trust venue at East Prawle did provided us with a wood burner in one barn… and even a couple of sofas! We always do too much… or try to at least. 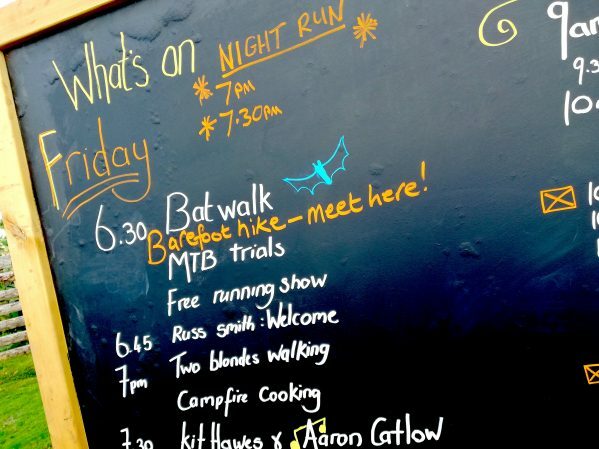 However, if you ever find yourself at an outdoor festival, do leave some time between swim running, night running, bat walking, goat yoga and coasteering (yep, we have it all in the South West) to do a bit of wandering around and enjoying your location. 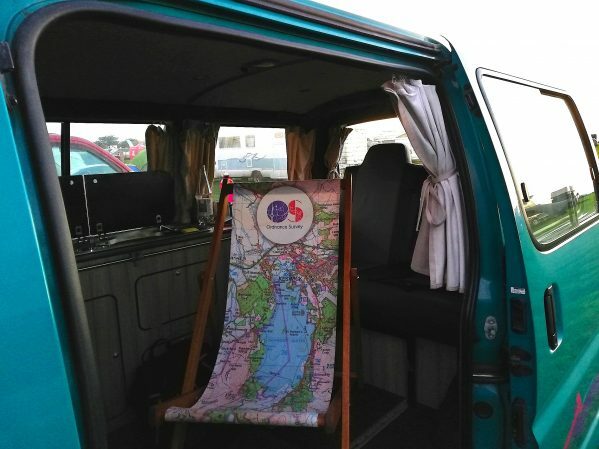 I thought that B1 and I had over-stocked the campervan with snacks but, as it turns out, outdoor festivals make you very hungry and, as well as our now traditional first and second breakfast, we also found ourselves munching first and second lunches, dinners and evening treats! Hungry work that talking and smiling! I caused a moment of hilarity during our talk when I was telling people about our navigation workshops the next day. Apparently it is funny to be a navigation expert but not actually know where your navigation workshop is going to be. We Blondes are good at this out on the hills but I hadn’t realised that outdoor festivals could require quite as much dynamic planning as this one did. It is lucky we are adaptable because nothing really went to plan… although everything turned out just peachy, probably because we were outside and that is where we love to be most. Wow! 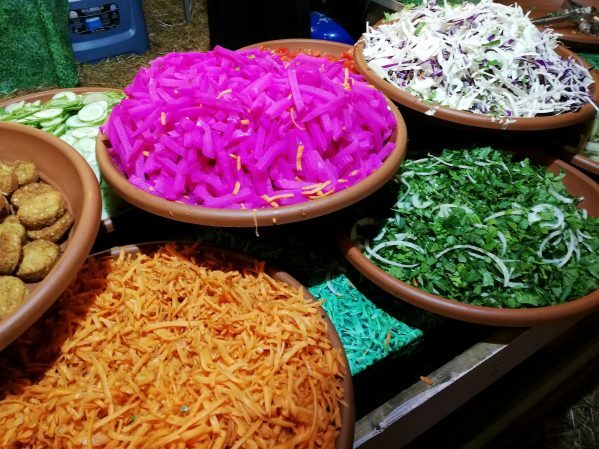 Colourful food! But I am a little concerned about the Motor Torpedo Boat trials on the notice board? Colourful and mostly vegetarian! They turned out to be very friendly Motor Torpedo Boats that looked much like mountain bikes!